Due to its excellent adhesive strength and great resistance, POXIPOL® is a unique home adhesive, ideal for bonds subject to heavy pressure throughout time. Poxipol® 10 Min. Metálicois available in small (21g / 14ml), medium (108g / 70 ml) and large (1.085kg / 700ml) cases. Poxipol® 10 Min. Transparenteis available in small (16g / 14ml), medium (82g / 70 ml) and large (826g / 700ml) cases. 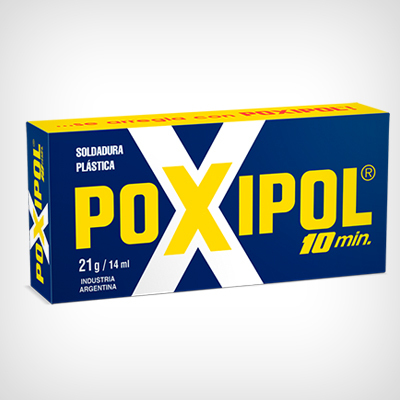 Poxipol® Fraguado Lentois only available in metallic color and medium-size cases (98g / 70 ml).